namesake design: Let's Get Cooking! If you are a regular reader of this blog you know that much of what I do here is inspired by my kids. I especially love to make things that will inspire creative play. When I saw how much Elliot liked playing with Beatrice's little talking Fisher Price kitchen, I decided to make him a kitchen of his own (I am sure Beatrice will like it when she is older too). 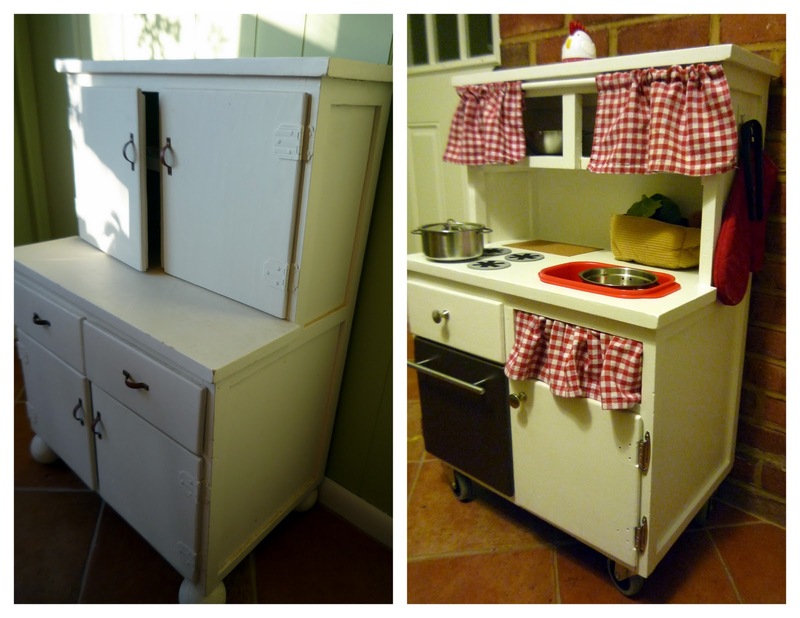 To make Elliot's kitchen I rehabbed a little play cabinet that had been sitting in my Mom's attic for years. Check out the before and after. Can you believe the transformation? Here's how I did it. First I removed the top doors (they would not be coming back). If I kept them on I wouldn't be able to open and close them when I added the sink and stove top. I also removed part of the upper cabinet support. Next, I removed the bottom doors, and one of the drawers so that I could sand and paint them and add the new hardware (all purchased at Home Depot). I removed the other drawer to make room for the sink. I found the sink at the Container Store. To set it into the counter top, I turned upside down, traced it and cut out the hole. I made the cut about a half a centimeter in from the line I drew so that sink would have a ledge to rest on. After cutting the hole for the sink, I patched any holes (from the removed doors and hardware), sanded the entire cabinet, then applied two coats of white cabinet/trim paint. I painted one cabinet door with metallic spray paint to make the oven. After the paint dried, I placed the sink it its hole and sealed it to the counter with some caulk. I used an old kitchen towel to make the curtain under the sink (which I attached with a staple gun) and the curtain over the shelf (which is hanging off a dowel that was cut to size and nailed to the cabinet). To make the stove, I painted wooden disks (from Micheals) and glued them to the counter top. I am so happy with the new kitchen and I hope it will be enjoyed for generations to come. The kitchen tools in the drawer are a mix of old and new. Some are from my mom's childhood. The little pots and pans are from Ikea. That looks so cool Amanda! Great job!